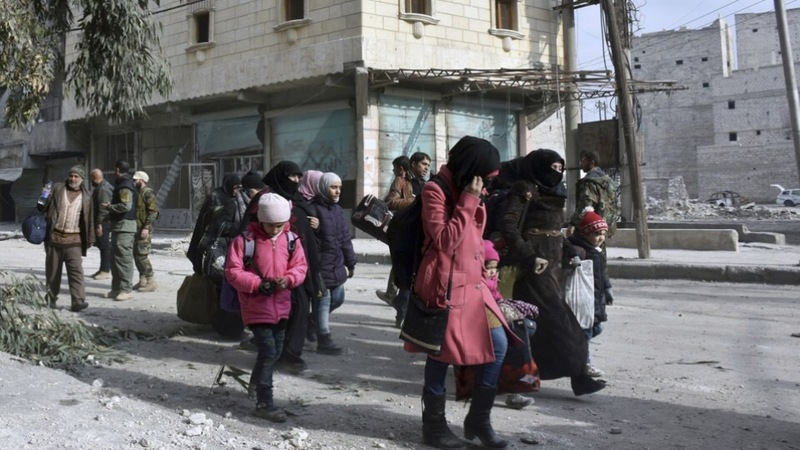 Aleppo (Syria) (AFP) – The Syrian government suspended the evacuation of civilians and fighters from the last rebel-held parts of Aleppo on Friday, leaving thousands of people trapped and uncertain of their fate. Russia, which helped to broker the evacuation deal with Turkey, said its operation was now “complete” with all women and children moved from the city. Ankara and a Syrian military source said the evacuation had been suspended but was not yet over. “The evacuations are not over and many people still want to leave the area,” said Turkish Foreign Minister Mevlut Cavusoglu. Amid the confusion, a convoy of evacuees that had already left the east when the operation was suspended was forced to return and reenter rebel territory, an AFP correspondent said. The delicate operation to bring the last civilians and rebels out of east Aleppo began on Thursday and had continued through the night, with thousands of people leaving in buses and ambulances. But on Friday morning it was abruptly suspended, with the government accusing rebels of violating the terms of the deal. “The evacuation operation has been suspended because the militants failed to respect the conditions of the agreement,” a security source told AFP. The International Committee of the Red Cross, which has supervised the evacuation, confirmed it was on hold. The opposition accused the government of suspending the operation in a bid to secure the evacuation of residents from two villages under rebel siege. “The regime and its militias… stopped the evacuation operation in another attempt to involve Fuaa and Kafraya,” said Yasser al-Youssef of the Nureddin al-Zinki rebel group. Fuaa and Kafraya are Shiite-majority villages in Idlib province that have been under rebel siege since 2015. The government and its other main ally Iran have reportedly sought to add an evacuation of civilians from the villages to the terms of the deal for Aleppo. The Syrian Observatory for Human Rights, a Britain-based monitor, also said the suspension appeared to be related to the two villages. It said pro-government fighters were blocking the road out of Aleppo that the evacuation convoy had been using and rebels were refusing the evacuation of residents of Fuaa and Kafraya. The evacuation of the last pocket of rebel territory in Aleppo began on Thursday under a deal brokered by Russia and Turkey. The operation had been scheduled to begin on Wednesday, but was delayed over government objections, including over Fuaa and Kafraya. Clashes resumed for several hours before the deal was revived, and on Thursday afternoon buses and ambulances began transporting evacuees to rebel territory in the west of Aleppo province. 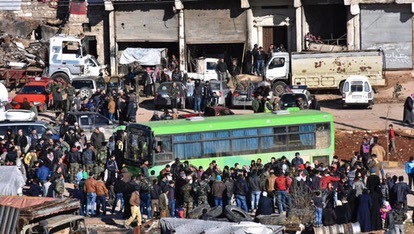 The evacuations ran through the night, with residents and rebels boarding green government buses and ambulances and later leaving in private vehicles. Initially, evacuees were leaving via a single convoy that travelled back and forth between Aleppo and the west of the province. But overnight, the vehicles began returning individually to collect more evacuees as soon as they had dropped off their passengers. The Observatory estimated some 8,500 people had left before the operation was suspended, including around 3,000 rebel fighters. Syrian state media reported a figure of around 8,000. Ahmad al-Dbis, a doctor helping coordinate the evacuation of the wounded, said at least 500 evacuees had wounds or illnesses requiring medical attention. From a gathering point near the town of Khan al-Aasal, people were travelling further west, heading either to camps for the displaced or to stay with relatives or friends. The departures began a month to the day after government forces launched a major offensive to retake all of Aleppo and secure the regime’s biggest victory in more than five years of conflict. In a video message to Syrians on Thursday, President Bashar al-Assad said the “liberation” of Aleppo was “history in the making”. But US Secretary of State John Kerry said what had already happened in the city was “unconscionable”, raising concerns for the “tens of thousands of lives that are now concentrated into a very small area of Aleppo”. The UN Security Council will meet later on Friday to discuss a French call for international observers to monitor the evacuation and ensure aid deliveries. It is unclear how many people remain in east Aleppo, with tens of thousands fleeing to territory held by the government or Kurds in recent days but perhaps tens of thousands still inside. The evacuations have been emotional for departing residents who were desperate for relief after months of bombardment and siege but tearful at the prospect of potentially permanent exile. In the dust on the window of one of the buses departing Thursday someone had traced: “One day we will return”. “The scene was heart-breaking,” said ICRC Syria head Marianne Gasser. More than 310,000 people have been killed since the conflict began with anti-government protests in 2011, and over half the population has been displaced, with millions becoming refugees. Diplomatic efforts including several rounds of peace talks in Geneva failed to make headway in resolving the conflict, which saw a turning point last year when Russia launched an air war in support of Assad. On Friday, Russian President Vladimir Putin said Moscow was “actively negotiating” with rebels through Turkish mediators. “The next step (after Aleppo) will be to reach agreement on a complete ceasefire across all of Syria,” he said on an official visit to Japan. He added that the parties were proposing fresh peace talks, possibly in Kazakhstan. Meanwhile Russia’s defence ministry has said the operation to evacuate rebels and their families from eastern Aleppo is complete, Russian media has reported. They continued that the ministry said more than 9,500 people, including 4,500 fighters and 337 wounded, had left the rebel-controlled sector of the city, and all women and children had been evacuated. They reported the ministry said some radical rebel fighters remained and were firing at Syrian troops in some parts of the city. 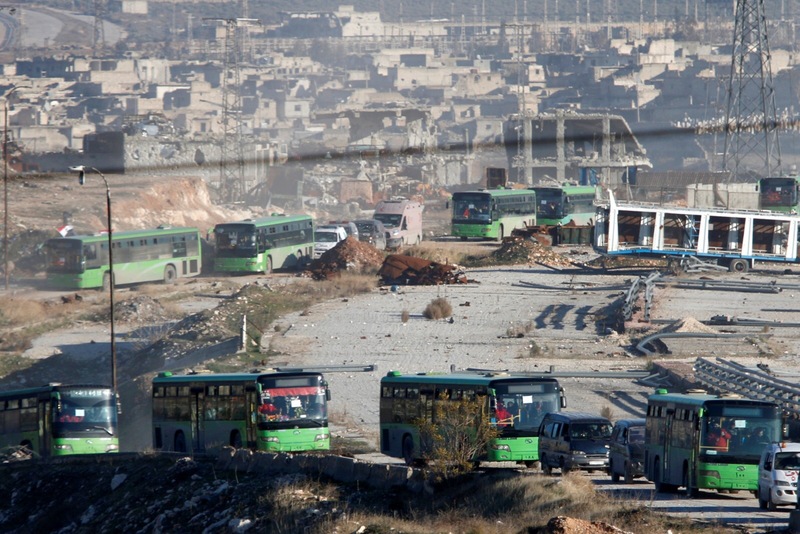 In response, a Syrian rebel official said the evacuation had not finished and that rebel fighters remained in the city, they added that only three convoys had left. Sri Lanka Blasts- Doubts over Islamist group's potential role: Are they the masterminds? Sri Lanka Blasts- Bungling Gov bureaucracy and petty politics cost hundreds of innocent lives?